National Agency for Food and Drug Administration and Control (NAFDAC), has reiterated its effort to ensure zero-tolerance to fake drugs with a breakthrough in the arrest and parade of additional four importers of fast moving counterfeit medicines and products, Thursday, in Lagos. 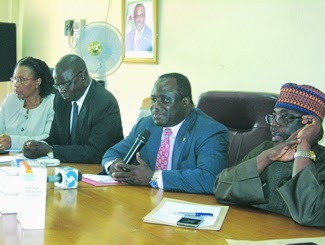 Announcing what he considered a groundbreaking event during a press briefing, Dr. Paul Orhii, Director General, NAFDAC, said that he is more embarrassed by people dying due to fake drugs than flimsy claims of those described as fake drug abettors on failure of technology in identifying fake products. Parading several counterfeit medicines which the agency seized since the past weeks, Orhii pledged to employ technology and method to stamp out fake drugs and products in the country. The total sum of the counterfeit medicines impounded is N59, 300,000. Among those who were paraded yesterday, by the agency is Mr. Paul Ogbonna of No. 8 Kujore Street, Ojota, off Ogudu Road, Lagos for sale of countrfeit medicines. Ogbonna was arrested on the May 17, 2011 for sale of fake Aldomet tablet and Moduretic tablet both are anti-hypertensive drugs used for the treatment of hypertension. At the time of interrogation, Ogbonna claimed not to have a shop and that he purchased the counterfeit medicines from an unknown individual. Investigation was conducted and he was to be arraigned in court on the January 18, early in the year but, he jumped bail and has since been on the run. After extensive intelligence work he was re- arrested, last week, May 25, and will soon be arraigned in court. The next is Mr. Celestine Eruokwu of No. 77 Mosafejo Street, Suru- Alaba, Lagos who was the arrested for importation of counterfeit Maloxine tablets. Based on an intelligence report that Eruokwu was in possession of counterfeit Maloxine tablets, operatives of NAFDAC Investigation and Enforcement Directorate raided his house at No. 77 Mosafejo Street, Suru-Alaba Lagos. There they discovered and impounded the following counterfeit medicine from him: Maloxine tablet: – (90,000 doses) 600 packets x 150 x Stabs with an estimated market value of nine million naira only. Investigation revealed that Eruokwu is a generator dealer and has a shop located at Idumota in Lagos. He confessed that he imported the product from China and that they are fake. The product has been sampled against him for laboratory analysis. Recent findings indicate that counterfeiters of medicines now hide under the shadows of other businesses to carry out their nefarious activities, the DG said. He further noted; “the product impounded from Eruokwu amounts to 90,000 doses which could have endangered the lives of ninety thousand patients.” Also among those paraded was Mr. Ifeanyi Edeh of No. 8 Agunlagiha Street, Ijesha, Lagos, for importation of Ciprotab 500 packaging materials.Ifeanyi was arrested by vigilant officers of the agency’s Port Inspection Directorate (PID) at NAHCO shed, cargo section of Murtala Mohammed Airport, Lagos, where he had attempted to smuggle the packaging materials for Ciprotab 500 tablets (an antibiotic). A total of 5,650 units of the packaging materials in a large carton was found in his procession and impounded from him. Upon interrogation he confessed to have imported the packaging materials from China and intended to use them to re-pack counterfeit Ciprotab 500 tablets. “This action would have endangered the lives of more than 5,000 patients, Orhii said. Also paraded were various illegal imported packaging materials including; packaging materials for Vermox 5OOmg tablets – 2packages; packaging material for Kenalog 40mg/ml injection (Triamcinone) – 1 large package; packaging material for Vaseline Cocoa Butter – 1 package x Grolls; Scotch Whisky labels – 1 package x 10,000 pieces and packaging material for Q3 Paris Carrot and Egg yoke whitening body milk, 9 packages. The rest are packaging material for Dettol Antiseptics – 8 packagesand packaging materials for Camros Blended Scotch Whisky – 7packages. “We have observed that the current trend now is to import packaging materials of popular and fast moving drugs such as antibiotics, injectables and antimalarials with the intention of packaging the fake, the NAFDAC boss said. He added: “Furthermore, most of those drugs are brought as unaccompanied cargo and concealed as general commodities and it takes the extra effort of our officers to detect them. “Another area of concern is in the importation of donated items especially drug products. We wish to reiterate that donated drugs must have a six months shelf life at the time of arrival in Nigeria,” Orhii said. He insisted, the agency is intensifying surveillance and monitoring activities daily to ensure fake, counterfeit, substandard and unwholesome regulated products do not enter into the country at will.